Experience this unique adventure to the Everglades National Park. You will find yourself deep in the Everglades, with a professional tour guide on an airboat flying over a river of grass and watching all the wildlife up close. Some of the animals you might encounter on the tour include alligators, turtles, snakes, birds and more. Includes transportation from/to any hotel of Miami Beach (Collins Ave) and Downtown. 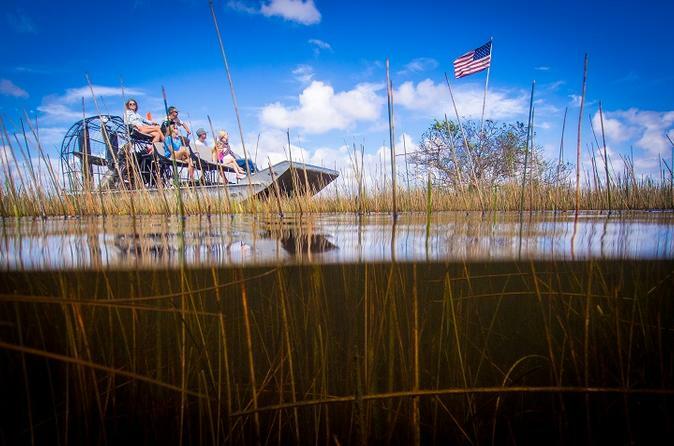 The Everglades Tour is the perfect family activity for the nature lovers and adventure seekers. Come on out and experience an adventure of a lifetime. After you are picked up at your Miami Beach or Downtown hotel, you will arrive at the Everglades National Park what is known for its vast wildlife. Hundreds of bird species, many of which are on the endangered or threatened list, reside here. The marine life is part of the main attraction with more than 200,000 alligators. American crocodiles also frequent the area, as well as local fish. Get ready for the ride of your life, 30 minutes of airboat tour beginning winding down the canal, providing plenty of photo ops to catch wildlife in their natural habitat. Experienced guides offer tips to ensure you spot large and small alligators, as well as soft-shelled turtles and birds you won’t find anywhere else. Keep your camera ready! After the ride, join us for the alligator and wildlife exhibits and learn about the barehanded technique that was used by the Seminole Indians to capture alligators. The tour ends with a relaxing ride back to your hotel.